At 21, Billy works in his garage art studio. His choices of colors are as diverse as the instruments he uses to ply his craft. Rubberized kitchen tools, artists’ brushes, hardware paint rollers, steel pads, and pharmacy combs provide the artist with a wealth of possibilities. No matter what music genre he selects that day: opera, jazz or rock and roll is the backdrop. 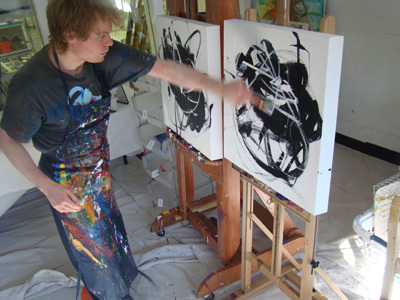 Billy, however, commands the moment as he rakes, flicks, rolls, sprays, throws and weaves the paint over the canvas. The result is that every work is, striking, original, and a memorable combustion of color, texture and physical virtuosity. 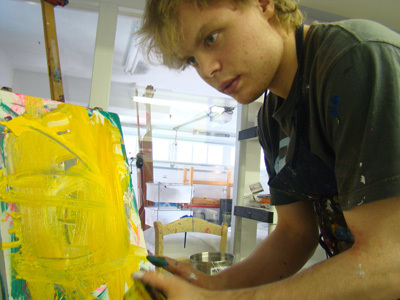 Freedom of personal and creative expression is at the heart of his life. Information about Billy's Communication style and a blog about his is available at www.voicecolors.org.